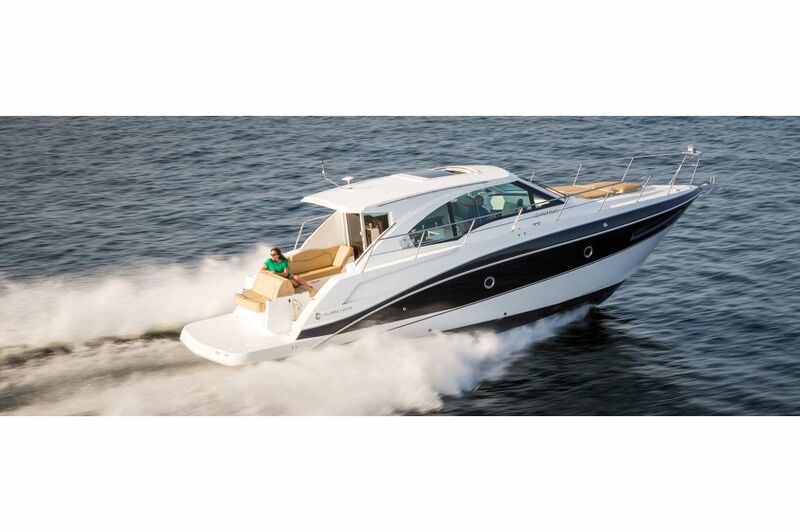 When you and your guests enter the cockpit of the spacious and well-designed 41 Cantius, you'll have everything needed within moments to entertain, relax and have fun on the water. With Starboard access and plush, comfortable L-shaped seating for 6, the cockpit of the 41 Cantius may become your favorite space. 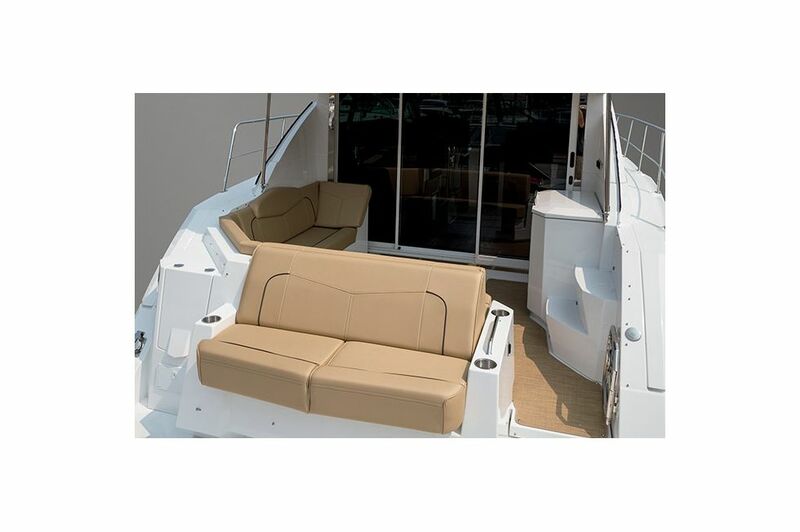 The built in storage under the seats as well as transom storage, helps for having all your gear readily available. Grab a drink and join your guests at the entertainment bar, equipped with bar stools, to watch the kids play or to catch up with good friends. Want to step up the experience? This yacht has an optional grill that's perfectly situated for feeding guests and staying connected to the conversation. 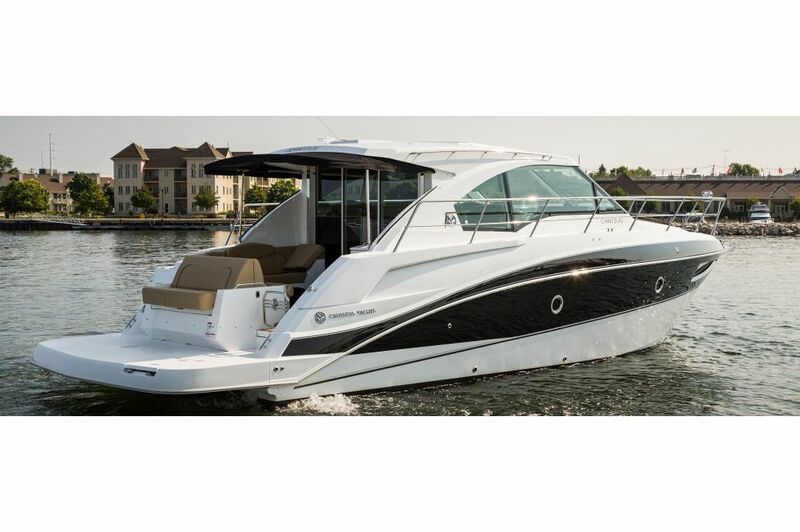 Picture yourself on the 41 Cantius today and learn more about the great features of this beautiful yacht. 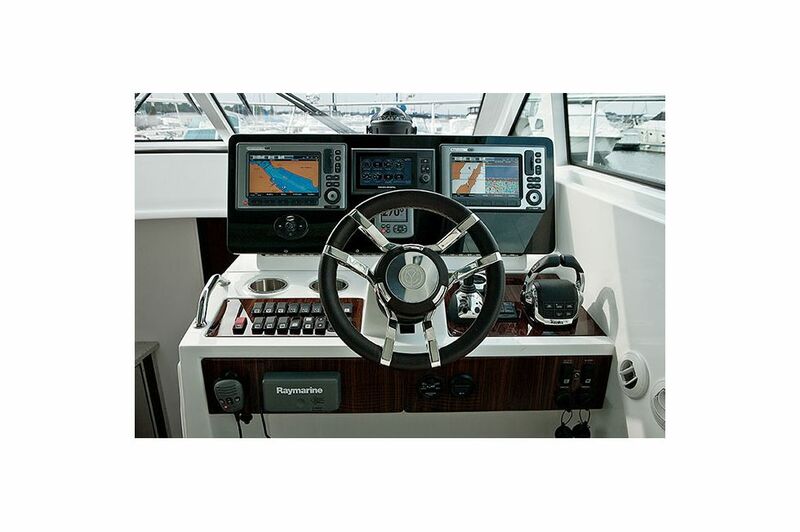 You should feel comfortable and in complete control when seating at the helm of your new yacht. 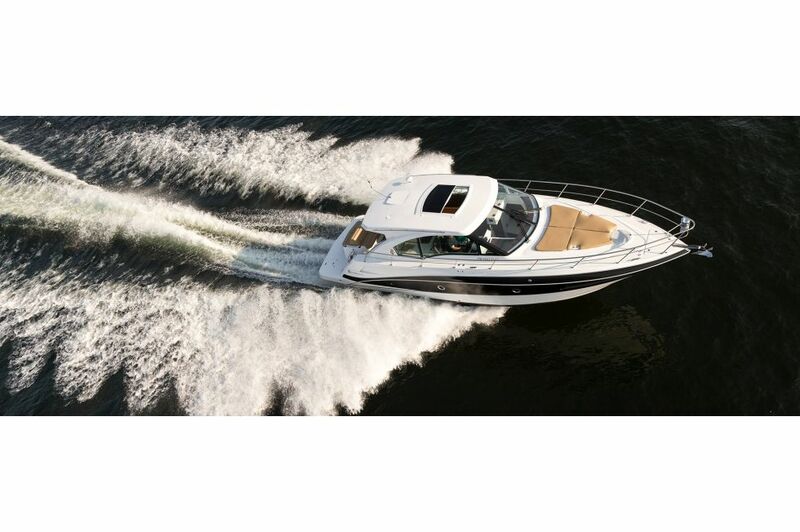 That's exactly what the 41 Cantius delivers. The navigational center hosts the latest technology, giving you the confidence needed to monitory and manage the twin Volvo Penta IPS 600 engines below deck. Joystick maneuvering is standard aboard this new and beautiful yacht, ensuring efficient and responsive handling. Also standard is a plush, and richly stitched double helm seat featuring a flip-up bolster. 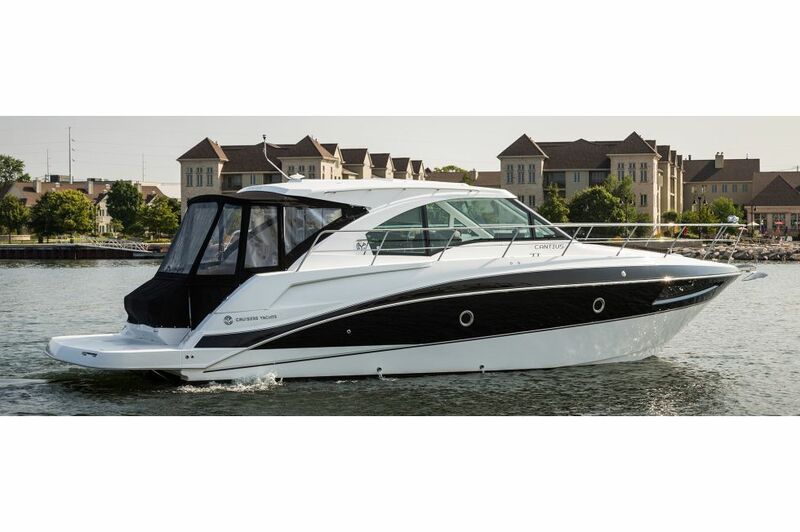 Add in the two-piece sold windshield and blackout/privacy screen to this space aboard the 41 Cantius and you have a helm that you can make entirely your own. 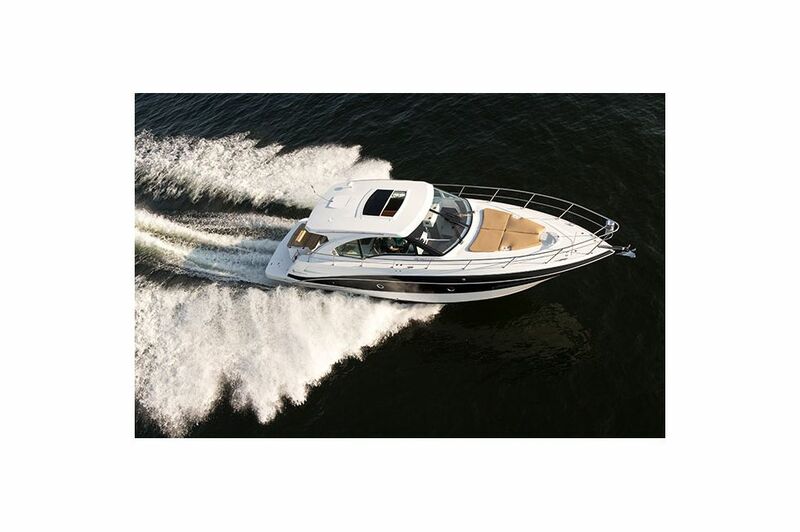 Don't waste a moment searching for what you need with the plentiful storage aboard this yacht. Easily stow away your gear, toys or safety equipment with study and organized storage units built within the transom of the 41 Cantius. The upper salon of the 41 Cantius will blow you away. Walking into this space, you'll find the triple wide opening door, giving you the flexibility to make this space as airy as you'd like. This space is beautiful designed to be chic, warm and luxurious. With 6'3" headroom, you'll feel comfortable to explore the incredible views or sit back and enjoy a movie with your guests. 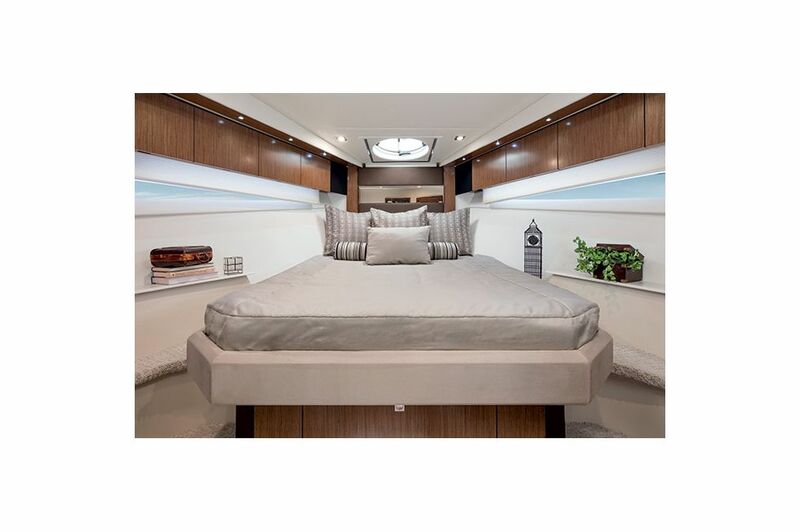 The large power sunroof on this 41 foot yacht gives you the control to take in all the sunlight or stars you could ask for. Within reach you'll have a sink, ample storage, an optional fridge/ice maker and a standard 22" TV above the sleek counter top. You'll have absolutely no trouble making this space exactly what you want it to be no matter the weather, time of day or the number of guests on board. 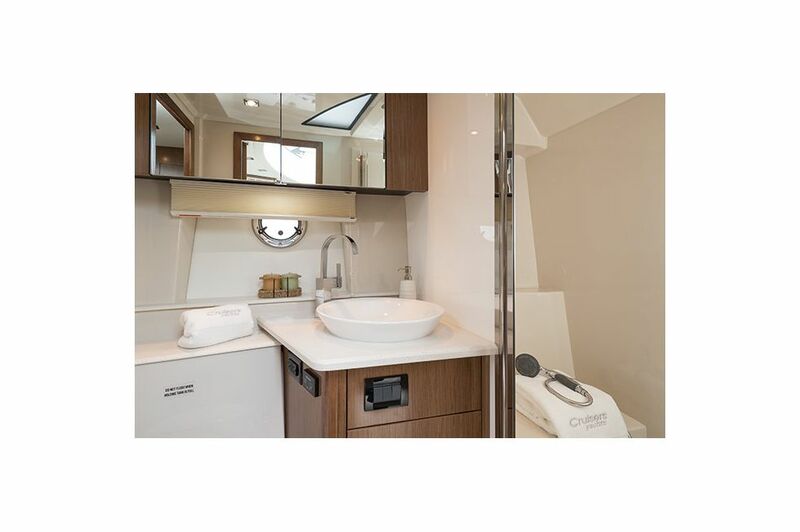 In the galley of the 41 Cantius by Cruisers Yachts you may have a tough time picking your favorite feature. It could be the beautiful and sleek wood detailed cabinetry, the stylish silver accents or the convenience of the appliances. 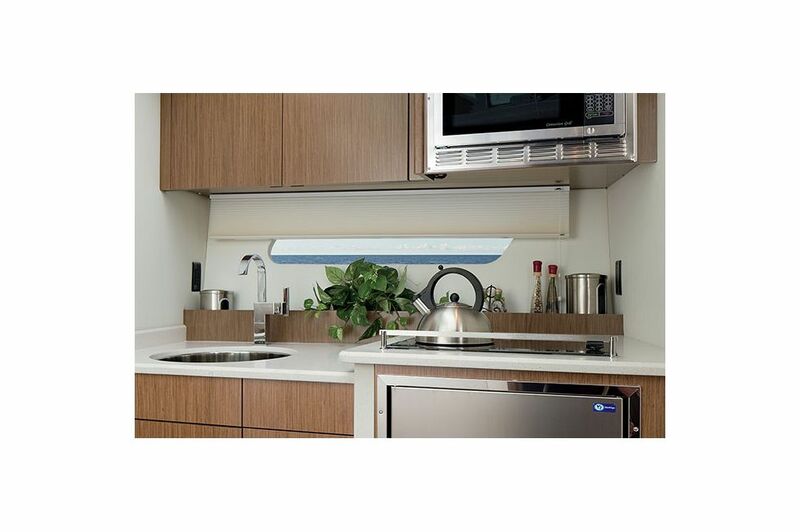 Whether needing to chill food/drinks or whip up a delicious meal with the help of the 2-burner stove and microwave/convection oven, you have everything you need in the galley of the 41 Cantius to ensure a wonderful trip for all on board. Just like so many spaces of the 41 Cantius, the master stateroom is impressive and charming from the moment you walk in. The beautiful wood detailed over-head storage, natural light from all sides and beautiful neutral colors throughout make this space a perfect retreat. 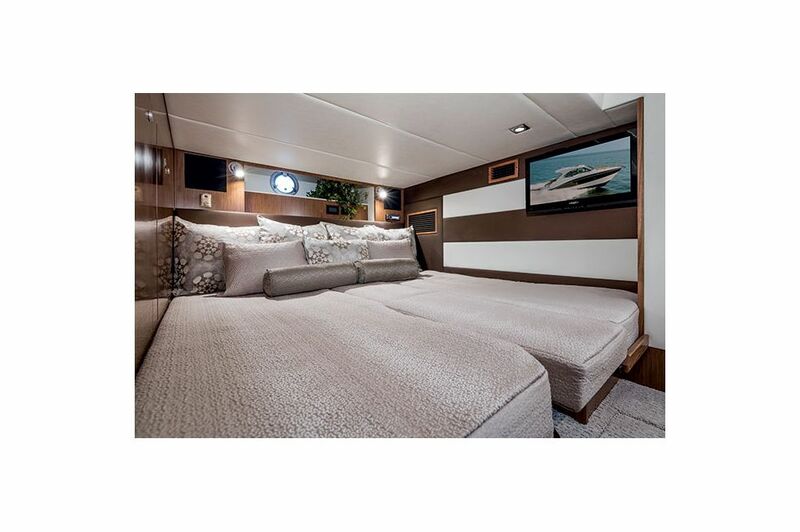 Enjoy the subtle movement of the sea below while resting on a queen size berth loving every moment on your beautiful yacht. Allow your guests their own retreat with the mid-ship aft stateroom perfect for a comfortable space to rest for the night. 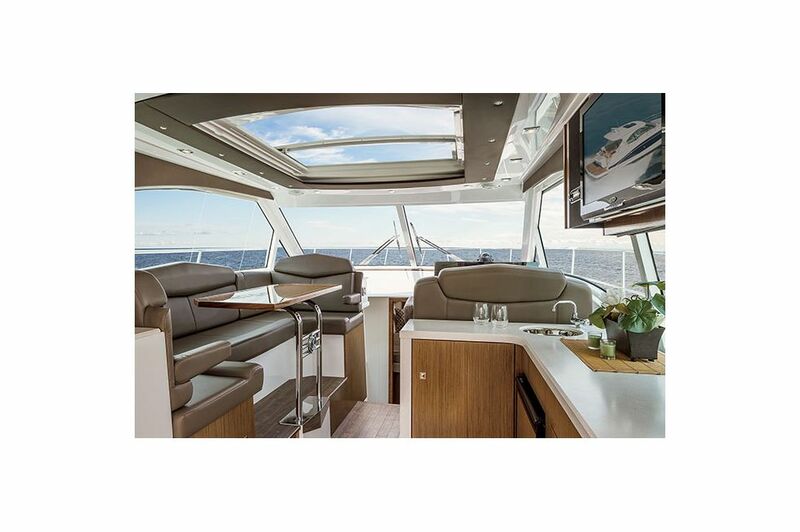 This space is just as flexible and stylish as you'd expect aboard the 41 Cantius by Cruisers Yachts. A split bunk feature allows for a separate sleeping space while it can be easily converted to a queen berth for extra comfort. 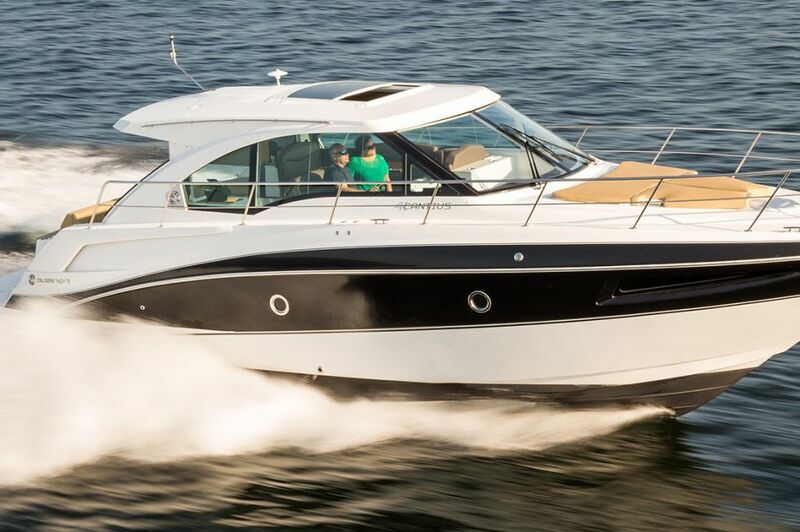 A private, pleasant aft head is another wonderful feature on the 41 Cantius. This space is a great get-away for your guests to enjoy the full-standing shower stall, stylish vanity and above and below storage. The only problem you'll have with having such a great head for your guests may be getting them go back home! No need to rush in this well laid-out master head. Sleek counter tops, storage above and below and plenty of headroom make this space one you won't be quick to leave. 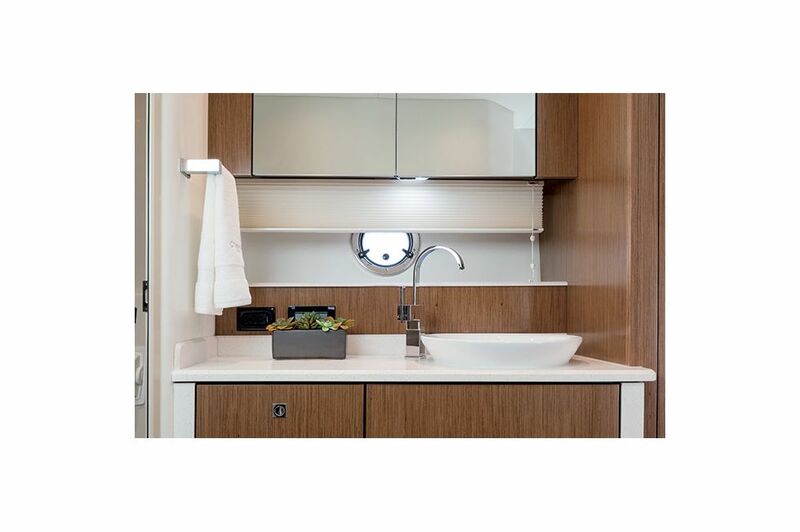 Natural light and the warm wood detailed cabinets make the forward head of the 41 Cantius a clean and comfortable space. The 41 Cantius is a incredibly designed yacht that delivers both in space and in performance and you'll know that from the view of the aft deck. The spacious deck provides numerous grips, elegant flooring with the star of the space being a convertible cockpit bench to sunlounge to table with bar stools for entertaining. Make this space exactly what you need with a moment's notice for endless opportunities as you make new memories. If a picture is worth a thousand words than the view from the bow lounge of the 41 Cantius must be worth a million. 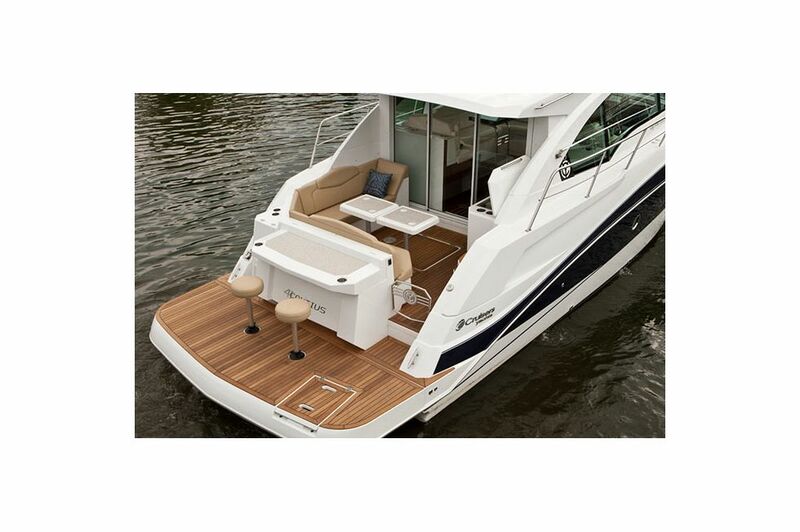 Relax, rest or catch up with your guests under the sun of the comfortable and spacious bow. With all the space you could use, the walk around feature of the 41 Cantius gives you the confidence needed to get wherever it is you're going. Whether you're fishing, relaxing at the bow lounge or visiting with guests at the stern, you'll love the walk-around of the 41 Cantius.